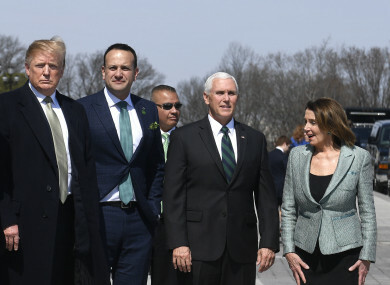 President Donald Trump with Leo Varadkar, US Vice President Mike Pence and House Speaker Nancy Pelosi. THE TAOISEACH HAS said he will never ask the US to choose between the UK and Ireland when it comes to Brexit. His comments come ahead of a visit from a Congressional Delegation from the US House of Representatives, which today begins a two-day fact-finding visit to Ireland. The delegation will be led by Speaker of the House of Representatives, Nancy Pelosi, and will include several members of the Friends of Ireland caucus. The delegation will meet with the Taoiseach at Government Buildings this afternoon, following a lunch hosted by the Tánaiste. Tomorrow, the Taoiseach will host a dinner at Dublin Castle in honour of the delegation. Speaking to TheJournal.ie ahead of the visit, he said he plans to discuss a range of issues including trade, visas, immigration and Brexit. However, he said he would never make the US choose between Ireland and the UK when it comes to Brexit. We are never going to ask the US to choose between the UK and Ireland. But we do ask them to understand our particular issues in relation to Northern Ireland. In fairness to Speaker Pelosi and the Irish-American caucus they really do, and they have been very helpful. In relation to getting more visas for Irish people to work in America, the Taoiseach said he is determined to get the E3 visa deal “over the line”. Varadkar hinted that the visit is part of a fresh push to get the E3 Visa Bill passed in the US. Congressman Richard Neal, who is a supporter of the E3 visa Bill, is among the US delegation. The Taoiseach said the plan is to get the Bill reintroduced and passed by Congress and the Senate. “We want to get this thing called the E3 visa over the line allow more young Irish people, generally graduates, to work in America. America is largely closed off,” said Varadkar. The Taoiseach said he would also like to see more American students coming to Ireland, as well as retirees and skilled workers. “So, it would go both ways,” he added. The undocumented Irish in America is also on the agenda, though the Taoiseach said “it is a very difficult issue”. In an interview with the 60 Minutes TV programme over the weekend, Pelosi hit out at US President Donald Trump, stating that he should not be the president. When asked if he agreed with Pelosi, the Taoiseach said Pelosi is a liberal Democrat. “Donald Trump is not, though he was a Democrat at one stage, though he is not at the moment, nowhere close to it. So they are political opponents. Though it was interesting to see on St Patrick’s Day they were at least willing to cooperate on certain issues, so I think there is maturity in that relationship maybe that perhaps doesn’t exist in some of the other relationships,” he said. Varadkar was perhaps unaware of the scathing tweets that US President Donald Trump sent about Pelosi following her TV interview, in which he called the interview a “puff piece” and said Pelosi had “lost all control of Congress and is getting nothing done”. The scathing tweets directed at Pelosi are seen as a departure for Trump. Despite their differences, the pair rarely engage in Twitter spats with one another. Email “Taoiseach says he won't ask the US to choose between the UK and Ireland as he welcomes Pelosi to Dublin”. Feedback on “Taoiseach says he won't ask the US to choose between the UK and Ireland as he welcomes Pelosi to Dublin”.